At first glance, this product does seem like another 7-inch tablet computer. But this is the first tablet computer running Android OS version 3.2 Honeycomb. This tablet computer adopts metal unibody design with a weight that is not too heavy. The design makes this product feels solid and steady. 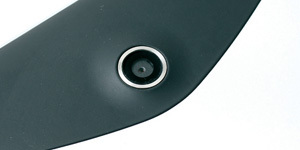 On the rear body you can unscrew bottom plastic to accessing SIM card slot and a micro-SD. While on front, there is a 7 inch screen. This screen does not seem to be protected by a scratch-resistant coating, as are trends in several tablet computer / smartphone lately. 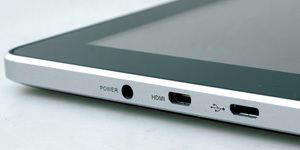 Around this tablet computer, you’ll find a variety of ports such as micro-SD, the adapter hole and micro-HDMI on lower side. In bottom corner of this tablet computer there is a small hole which is the microphone hole. Well, Mediapad S7-301U can be used to call even if you only rely on speakers or headphones. Speaker and headphone jack for those located at the top of tablet computer. While power and volume buttons are placed on the right side computer tablet. In terms of software, Mediapad provide some interesting applications ranging from e-book reader Aldiko, Yozo Office to work, until cool game Asphalt 6. Thus any kind of user needs can be met. Of course, you can still add your own choices apps from Market/Google Play. The most interesting is when we look into the Settings and select the settings screen. Apparently, in which there is uncommon settings which is display resolution choices. You can choose between Standard and High. It also makes us curious. Therefore, we were immediately shot. Apparently, the original display option tablet computer screen is set at High. Meanwhile, if Standard option selected, the display icon and the text will be enlarged. It is much like if you lowering resolution on a PC monitor. But strangely, after checking with several applications, whatever the choice, keep the screen resolution 1280 x 800. We were reassured by the graphics benchmark scores did not change at all in two resolution options. From benchmark side, Mediapad S7-301U produces a good score. This is because product is equipped with SoC MSM 8260 a dual core processor speed 1.2 GHz and qualified Adreno 220 graphics chip. These devices can easily play high definition files with different formats and extensions. One thing we noticed, for.mkv file types, this tablet computer player can not play smoothly. The solution, use an alternative player such as the MX Video Player. Huawei offers many advantages for 7 inch tablet this. High-resolution screen and integrated micro-HDMI port became one of its appeal. 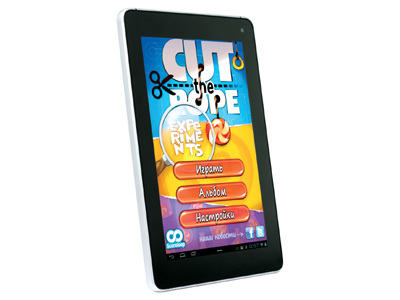 Its high performance also helped Mediapad S7-301U to compete with other 7-inch tablet. Since we update Quadrant and Linpack, Quadrant and Linpack test using a previous version is not displayed. Here we see that the SoC Exynos that is used by Galaxy Tab 7 Plus is far superior, but operates a little faster. However Mediapad S7 still able to bring their own good performance. Stereo speakers are able to sound aloud. Unfortunately the quality is fairly mediocre.